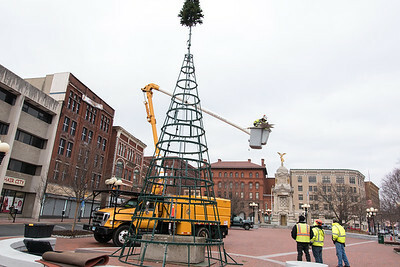 01/16/19 Wesley Bunnell | Staff City workers taking down the Central Park Christmas Tree on Wednesday afternoon. 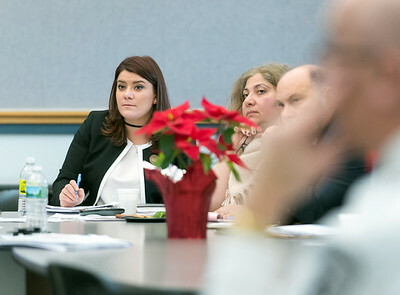 01/16/19 Wesley Bunnell | Staff The City of New Britain Opioid Task Force met on Wednesday afternoon at city hall consisting of members from the city, state and healthcare organizations. 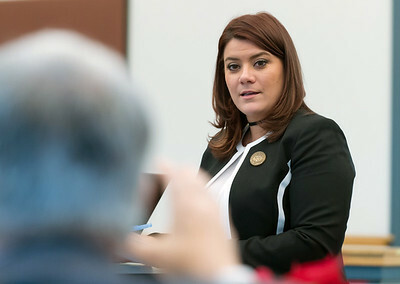 Mayor Erin Stewart during a presentation. 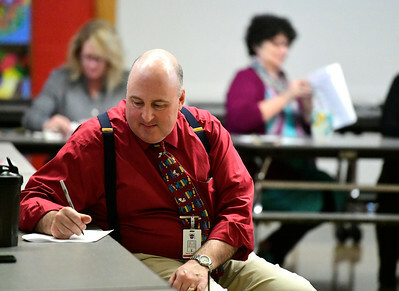 01/16/19 Wesley Bunnell | Staff The City of New Britain Opioid Task Force met on Wednesday afternoon at city hall consisting of members from the city, state and healthcare organizations. 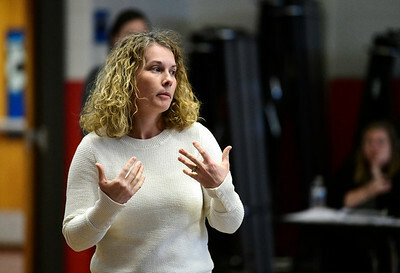 Ramona Kubilius Anderson , Program Manager of the Opioid & Prescription Drug Overdose Prevention Program from the CT Dept. of Public Health gives a presentation. 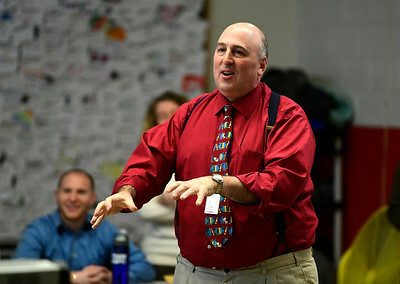 1/16/2019 Mike Orazzi | Staff Northeast Middle School’s Daniel Sonstrom during Shred Hate, an ESPN program launched in January 2017 to eradicate bullying in schools and encouraging kids to choose kindness in Bristol Wednesday. 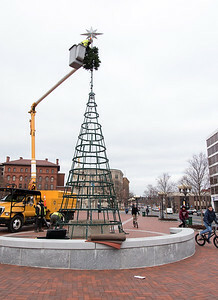 01/16/19 Wesley Bunnell | Staff The City of New Britain Opioid Task Force met on Wednesday afternoon at city hall consisting of members from the city, state and healthcare organizations. 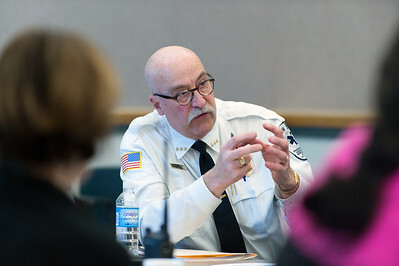 CEO of New Britain EMS Bruce Baxter during a presentation. 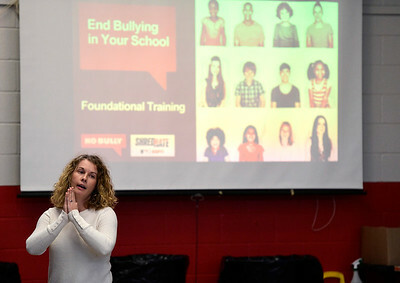 1/16/2019 Mike Orazzi | Staff ESPN's Jen Paulett during Shred Hate, an ESPN program launched in January 2017 to eradicate bullying in schools and encouraging kids to choose kindness in Bristol Wednesday at the Northeast Middle School. 01/16/19 Wesley Bunnell | Staff The City of New Britain Opioid Task Force met on Wednesday afternoon at city hall consisting of members from the city, state and healthcare organizations. 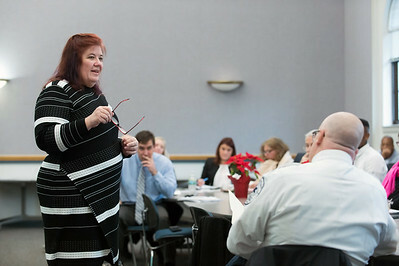 Mayor Erin Stewart during her presentation. 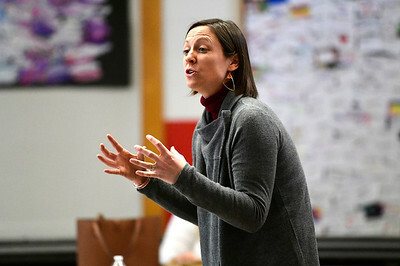 1/16/2019 Mike Orazzi | Staff No Bully's Jennifer Brevoort while speaking to Northeast Middle School staff members while as part of ESPN's Shred Hate program in Bristol Wednesday at the Northeast Middle School. 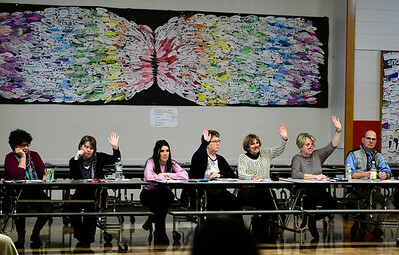 1/16/2019 Mike Orazzi | Staff Northeast Middle School staff members while participating in ESPN's Shred Hate program in Bristol Wednesday at the Northeast Middle School. 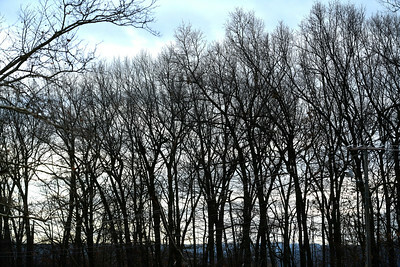 1/16/2019 Mike Orazzi | Staff A winter sky in Bristol Wednesday at the Northeast Middle School. 01/16/19 Wesley Bunnell | Staff The City of New Britain Opioid Task Force met on Wednesday afternoon at city hall consisting of members from the city, state and healthcare organizations. 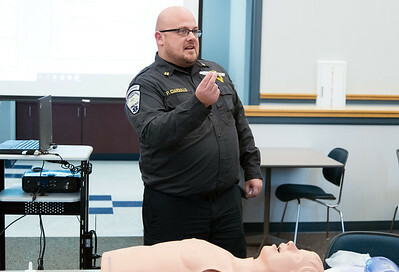 Paramedic Patrick Ciardullo holds a dosage of Naloxone which is carried by emergency personnel to counter the effects of opioids. 01/16/19 Wesley Bunnell | Staff The City of New Britain Opioid Task Force met on Wednesday afternoon at city hall consisting of members from the city, state and healthcare organizations. 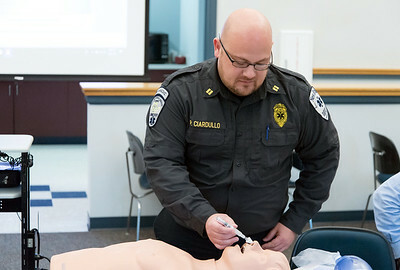 Paramedic Patrick Ciardullo demonstrates how to administer a dosage of Naloxone which is carried by emergency personnel to counter the effects of opioids. 01/16/19 Wesley Bunnell | Staff The City of New Britain Opioid Task Force met on Wednesday afternoon at city hall consisting of members from the city, state and healthcare organizations. 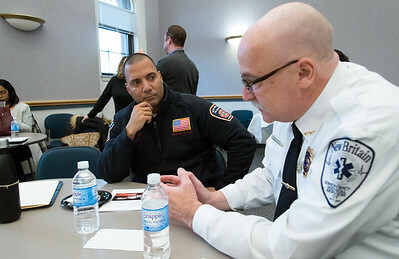 Fire Chief Raul Ortiz, L, speaks with CEO of New Britain EMS Bruce Baxter. 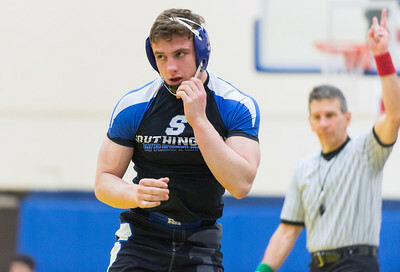 01/16/19 Wesley Bunnell | Staff Southington wrestling defeated Newington at Newington High School on Wednesday night. Southington's Caleb Chesanow vs Wyatt Bernard in the 195lb match. 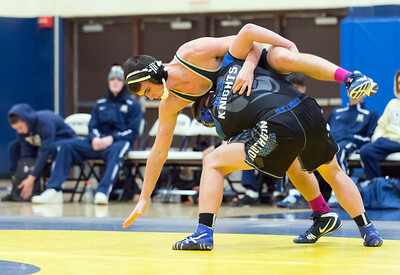 01/16/19 Wesley Bunnell | Staff Southington wrestling defeated Newington at Newington High School on Wednesday night. Newington's Wyatt Bernard vs Southington's Caleb Chesanow in the 195lb match. 01/16/19 Wesley Bunnell | Staff Southington wrestling defeated Newington at Newington High School on Wednesday night. Southington's jacob Vecchio vs Newington's Newington's Max Usmanov in the 220lb contest. 01/16/19 Wesley Bunnell | Staff Southington wrestling defeated Newington at Newington High School on Wednesday night. Southington's Ben Gorr vs Matt Stomsky in the 113lb match. 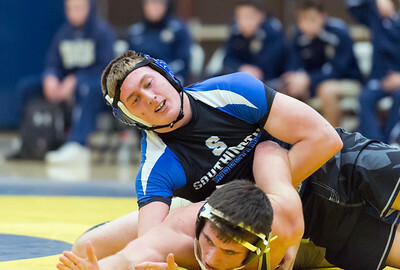 01/16/19 Wesley Bunnell | Staff Southington wrestling defeated Newington at Newington High School on Wednesday night. Southington's Emmett Vitti vs Newington's Andrew Kulowski in the 120lb match. 01/16/19 Wesley Bunnell | Staff Southington wrestling defeated Newington at Newington High School on Wednesday night. Southington's Caleb Brick vs Newington's Tito Cruz in the 126lb match. 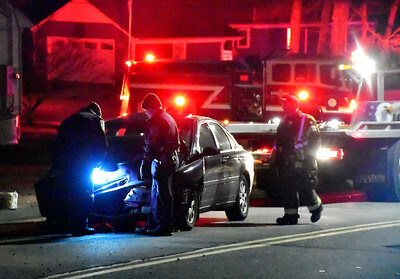 1/16/2019 Mike Orazzi | Staff The scene of a three-car crash on Mix Street near the intersection with Jerome Avenue. 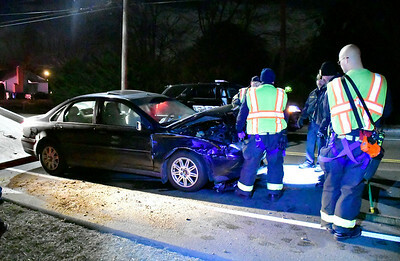 No injuries were reported and the road was closed about an hour.